In the lush, winding Women and Children’s Park in the Prairie Avenue Historic District, kids play hide-and-seek near a bubbling fountain while day camp counselors mediate tiffs between toddlers. A mother of two pushes a stroller, picking a few apples from one of the garden’s trees and stowing them in her backpack. “I’ve already baked two pies,” she admits. The scene is peaceful, bucolic—it’s hard to believe that it unfolds just blocks from the pulsing commercial center of Chicago. The South Loop, or “Sloop,” as it is commonly called, stretches from the Stevenson Expressway to Congress Parkway and from the lake to the Chicago River. The area has seen waves of affluence and decades of desolation, high culture and heavy crime over the last century. In the past two years, after suffering through the 2008 housing crash, a tight-knit community has begun to spread its roots in the Sloop, reflecting a desire among Chicagoans to live, once again, in a commercial center. That’s the mindset of Emily Mooney and her husband, Todd, recent transplants from Lombard, Illinois, who moved into a condo apartment on Michigan and Roosevelt in September. Mooney, a lover of cities who got her undergraduate degree in urban studies, wanted to be in a place where she could take full advantage of Chicago’s cultural offerings. “I wasn’t trying to live anywhere fancy,” she said. “Just somewhere urban.” Ready to leave the suburbs, Mooney shied away from other North Side neighborhoods—many annexed suburbs themselves—which felt isolating. This isn’t the South Loop’s first stint in the residential spotlight. In the mid- to late nineteenth century, Prairie Avenue was prime real estate. The 1800-2100 blocks of this street are where Chicago’s wealthiest industrial engineers and entrepreneurs—George Pullman, Marshall Field, and Philip Armour, to name a few—made their homes, leading to the neighborhood’s nickname: “Millionaire’s Row.” That was the case until the early twentieth century, when noise and pollution from booming printing, publishing, and auto industries began to encroach, and proximity to the Loop began to be seen as a disadvantage rather than a boon. Moneyed Chicagoans moved north and south, taking up residence in neighborhoods that provided them access to—but also considerable distance from—the city center. The Sloop’s revival as a residential area can be seen in community projects such as Sloopin’, a popular blog devoted to “all that is and could be life in the South Loop.” South Loop residents post on a daily basis about everything from store openings to food drives to photo contests. The blog’s founder and editor, Ryan (who declined to give his last name), started Sloopin’ after moving to the area from the North Side in 2008 and finding a dearth of consistently updated information on the neighborhood. Like Mooney, he extols the benefits of the South Loop’s central location. For him, proximity to the lake, CTA, Grant Park, and Museum Campus—where he often picnics on the grass with his family—are hard to beat. The diversity of the South Loop’s current population is also a draw for many. Mooney, who says parts of the North Side felt like a “lily-white enclave,” appreciates the racial and cultural variety in the neighborhood. South Loop citizenry, according to Ryan, including its share of young professionals, is balanced between college students, retirees and—increasingly—young families like his own. “You see a lot of babies and dogs around here,” he said. 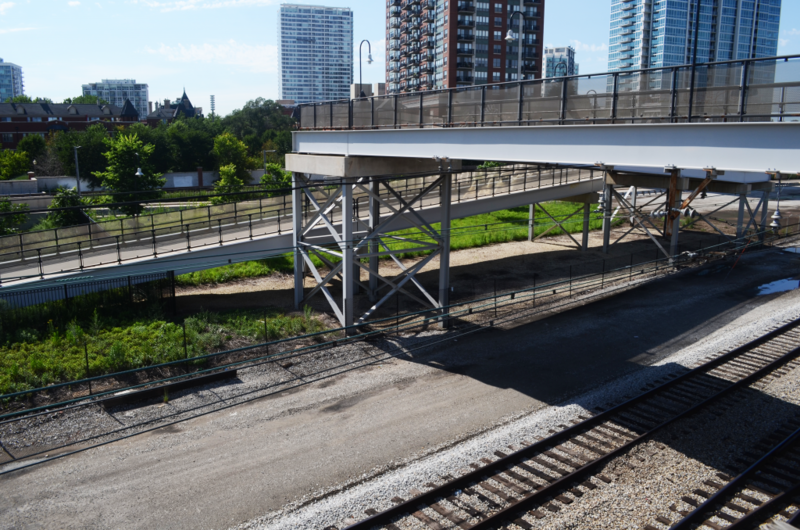 This is not to say the South Loop is homogenous, consisting of several small but distinct neighborhoods, each—like Prairie Avenue—reflecting a different episode in South Loop history. Printers Row, which runs along Dearborn between Congress and Polk and was once the heart of Chicago’s literary industry, exemplifies the South Loop’s efforts to preserve its past while catering to new residents. The red brick Donohue Publishing House has been converted into loft housing. The Old Dearborn Station, the oldest train station still standing in Chicago, has been turned into retail and office space. The rustic exterior now houses doctors’ offices, legal practices, and a ballet studio. Even Sandmeyer’s Bookstore, a neighborhood staple since 1982, seems to be straddling two worlds. Exposed brick and pipes on the ceiling hark back to an earlier time, but the books, mindfully arranged on metal racks, angled somewhat sparsely throughout the single room, are all new. At times, the old Printers Row feels somewhat abandoned, with historical remains blending in among new growth. That isn’t necessarily a turnoff, though. “I kind of like the ghost-town vibe,” said Mooney. Other parts of the South Loop more actively celebrate the neighborhood’s past. The exclusivity that once defined the Prairie Avenue Historic District seems to have disappeared along with Pullman and Field. Posters detailing the history of the homes and restoration line the streets, and tours of the inside of the Clark and Glessner Houses are available to the public. Meanwhile, the Clark House backyard has been repurposed as the Women and Children’s Park, from which, on a recent afternoon, the shouts of kids from the local soccer league could be heard hawking their wares from a lemonade stand nearby. The South Loop may well be a place where history and community can coexist among big business and new development. It certainly looks that way from the Mooneys’ living room window, where, from twenty-five floors up, Emily and Todd can see both Grant Park and the train tracks that hauled freight and passengers into the city over 100 years ago.